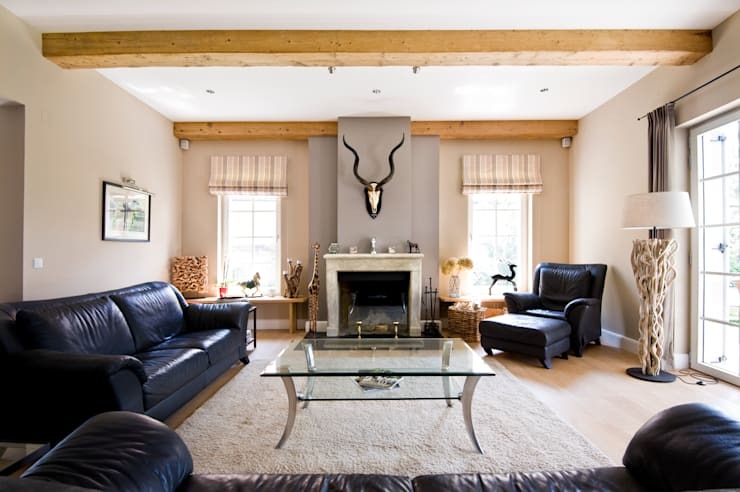 Today’s feature dwelling is a real stunner, and we know your going to love it! Pack your bags folks, because we’re heading to Vienna, Austria to take a rare tour inside one of its finest rural homes. Designed by the team at Wunschhaus, this beautiful family abode combines modernity and tradition to create a striking villa that truly sets itself apart from the rest. Our first view of this home is from the rear façade, which offers a sense of classic style, with plenty of entertaining potential. Grand and modernised, this dwelling is spread over two storeys, with a large upper terrace on one side. Charming, with subtle hints of quaint character, the house spills out into the manicured grass, ensuring the occupants have plenty of opportunities to make the most of their garden. Boasting an L-shaped form, this gorgeous home invites you in as if ready to receive a nice cosy hug. With its bright cream render and tiled roof, it’s picture perfect and sure to delight. The entrance has been paved with cream stone, which lead up towards the modest yet charming front door. Bright blooms are seen in the window planters, along with plenty of potted greenery to impart a welcoming and homely ambience. Now, here’s something for those animal lovers we were talking about. 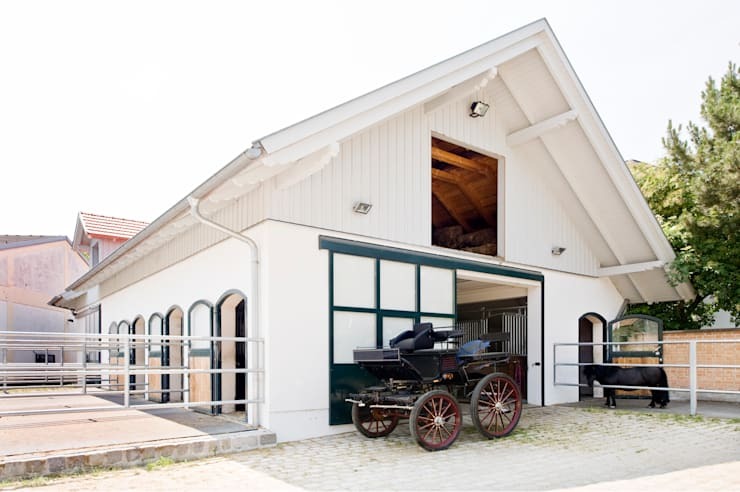 These chic stables have been designed to match the décor and design of the main house, and offer the dwelling a sense of history and charm. 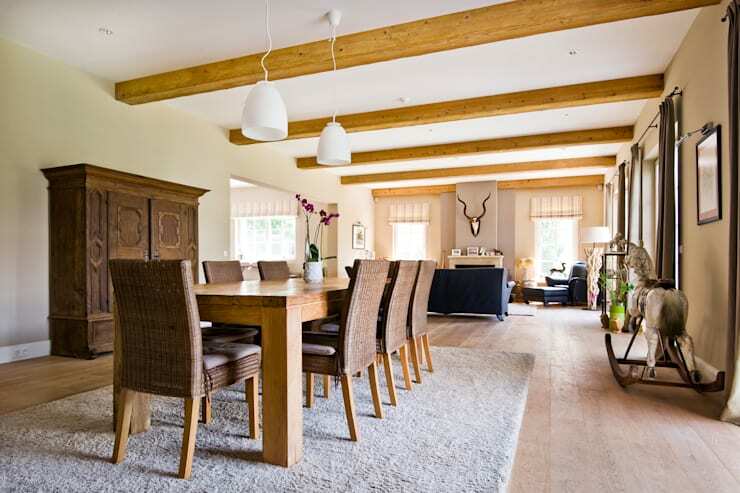 In addition they provide ample and lavish accommodation for the family’s horses. Of particular note is the charismatic vehicle at the front, which gives the structure a vintage feel. Finally heading inside the home, we direct ourselves towards one of the most important rooms in the house: the kitchen. 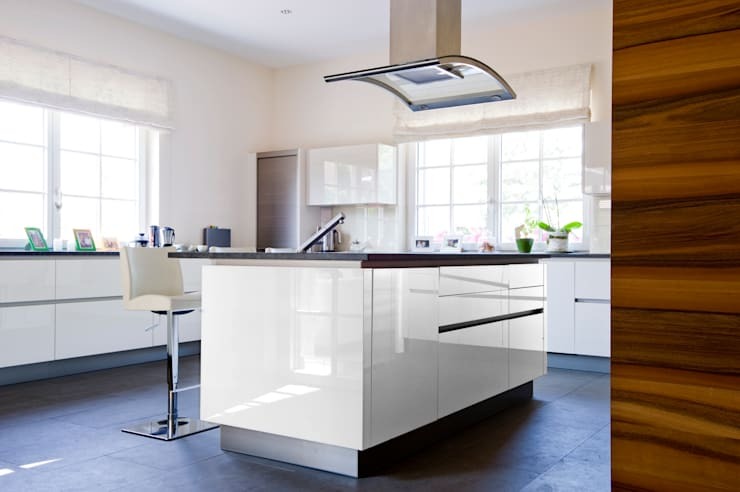 Replete with white gloss joinery and contrasting countertops, the space feels luxurious and contemporary, with an essence of minimalism and simplicity. A central island provides additional space, along with a easy-care slate floor that is simple to maintain. In-keeping with the modern farmhouse aesthetic, the designers have included accessories and accoutrements that enhance the overall ambience. 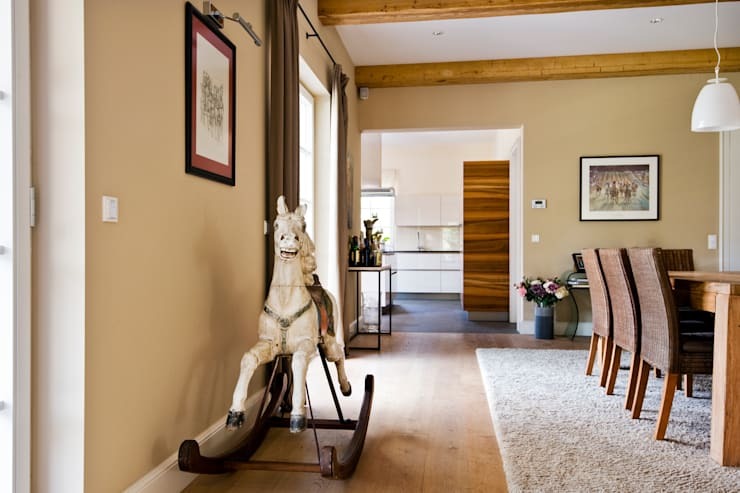 In this hallway we see a vintage rocking horse that adds a rustic and subtle elegance. Throughout the abode we see that the rooms have been designed to suit a modern yet rustic template. They are sophisticated yet comfy, with plenty of provincial accoutrements that add to the overall atmosphere. With intriguing and unique pieces of furniture, art and decorative accessories, this room certainly shines with a sense of individuality and originality. Coming to the end of our tour, we take a better look at the living zone. Stepping away from the living room we see the dining room in more detail. From this vantage we’re also able to see the exposed beams on the ceiling, which assists in incorporating the rustic aesthetic. Interactive and social, the open-plan layout of this large room ensures movement between the two areas, while still spacious enough to feel private and separated. Would you love a stable in your back garden?